While military personnel carry the President's coffin, a riderless horse waits. The horse's name is "Black Jack." Note the reversed boot in Black Jack's left stirrup. It symbolizes that the deceased will never ride again. Public-domain photo by SP/4 David S. Schwartz, online via the JFK Library and Museum, image SC-49-079-1462-11. Using the funeral of Abraham Lincoln as a model, Jackie Kennedy and Washington officials planned a state funeral for the President. A wealth of photographic evidence depicting the President's wake, his funeral, and his final journey from St. Matthew's to Arlington Cemetery is available at the National Archives. Only invited guests were allowed to view the President's flag-draped casket, lying in state in the East Room of the White House. Members of the general public were allowed to pay their respects when the President's coffin was brought to the Capitol rotunda. Mrs. Kennedy and her two children followed the casket up the Capitol's steps. 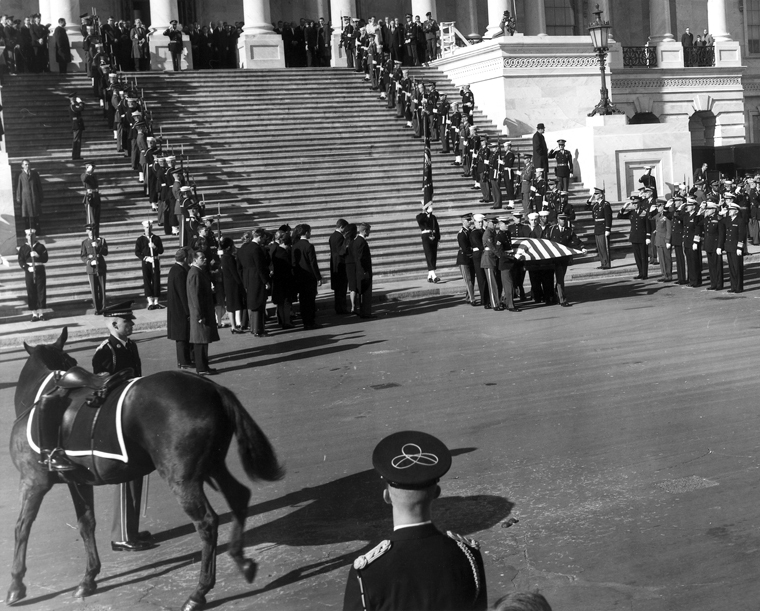 Lyndon Johnson, the new President, honored John F. Kennedy, the fallen leader, at services held in the Capitol rotunda. Millions of Americans watched on television as Jackie and her two children left the Capitol. Crowds also lined the Washington streets on the day of the funeral, 25 November 1963. A caisson bore the flag-draped casket during the funeral procession (led by Jackie and the President's brothers) from the White House to St. Matthew's Cathedral. As the caisson bearing his father's casket passed by, the young John Kennedy saluted his father. The famous picture, memorializing his poignant tribute, was taken by Stan Stearns. The day of the funeral was John's third birthday. The committal service at Arlington Cemetery was a particularly moving ceremony. Servicemen, from each branch of the United States military, removed the flag from the President's coffin and gave it to Mrs. Kenendy. Jackie lit an eternal flame at her husband's grave site. After the funeral, Mrs. Kennedy received well-wishers in the Red Room of the White House. In early December, Congress passed a law to help Mrs. Kennedy defray her expenses. Included in the appropriation was a payment to be used for the President's burial expenses. The flame still burns, but now there are more graves. Jackie was buried at her husband's side when she died of cancer in 1994. Two of their children are buried next to their parents: Patrick, who lived only a few days and died about three months before his father, and the couple's first child, a still-born daughter. The ashes of their third child, JFK Jr., were buried at sea. (So was the coffin that carried the President's body from Parkland Hospital to Washington, D.C.). Controversy over the assassination continues. Was there a second gunman? If so, who was it? Some historians believe there may have been a third shooter. Could that really be the case? Was there a conspiracy? If so, who was involved? Where, exactly, was the President struck? We may never learn the answers to some of the important questions. But there is one witness who saw exactly what happened when a bullet struck the President's head. Jackie Kennedy was looking at her husband when he was mortally wounded. And while she did not permit her 313-minute interview with William Manchester to be unsealed during her lifetime, the tapes will ultimately be available - in 2067 - one hundred years after they were made. When those tapes are finally played, the public will likely hear Jackie say it didn't matter to her whether there was a conspiracy to kill her husband. What mattered was that her husband was dead. It wasn't important to her who pulled the trigger. What was important was that her children had lost the father they adored. Bos, Carole "THE PRESIDENT'S FUNERAL" AwesomeStories.com. Oct 01, 2005. Apr 23, 2019.